Historical significance: Born in Eperjes, Hungary probably in 1660, Jacob Bogdani was the son of a landed gentleman. He travelled west, perhaps via Vienna, was documented in Amsterdam between 1684 and 1686 and was residing in London by June 1688. Producing predominately flower pieces, Bogdani was working in competition with the Verelst family and Jean-Baptiste Monnoyer (1636-1699) in the 1690s. At the beginning of the Eighteenth Century he began producing bird paintings. Through his marriage to Elizabeth Hemmings, Bogdani became Lord of the Manor of Hitchin and he was naturalised a British citizen on the 11 April 1700. Bogdani’s prolific and prosperous career enabled him to purchase estates at Finchley, Spalding and Hitchin. 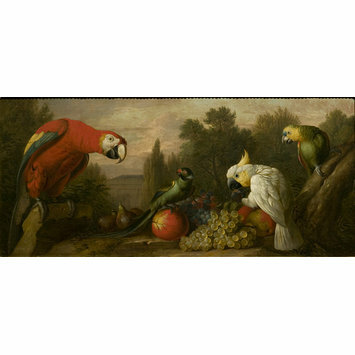 This painting, in landscape format, presents four exotic birds. The birds are shown perched on branches and fruit in front of a landscape of trees that leads back to a distant house. The soft hues of the trees create a neutral backdrop for the bright colours of the rich plumage of these birds that combine in a luxurious display. This feeling of wealth is echoed in the group of grapes, figs and mangoes, placed at the centre of the composition. The origins of this fruit also reflect the exotic homes of the birds. While the fruit emphasizes the feeling of exoticism, it also allows Bogdani to demonstrate his ability at painting different textures. This can be seen particularly in the contrast of the mat black grapes and the shiny green grapes. Bogdani’s keen observation of the fall of light on is also effectively employed to convey the texture of the brightly coloured feathers of the four birds gathered around the fruit. Many of the birds in this painting appear in different groupings in Bogdani’s works. For example the Scarlet Macaw appears in the same posture, although perched on a melon on the left side instead of a trunk as in P.6-1950, in his Still Life with Birds in the Hungarian National Gallery, museum number 3681 (See Green, cat. 7). Both these paintings also feature a Yellow-naped-Amazon perched on a trunk in the lower right of the painting, leaning in to the centre. The Cockatoo, shown eating a grape held in its left foot, is the same posture as that in A still life with fruit, a macaw, a cockatoo and a parrot in a private collection (for an image see: Green, cat.23). The large number of surviving works by Bogdani, combined with his recycling of the motifs of birds in many of his paintings suggests that the artist was operating a studio to supply to the high demand for his paintings. Bogdani’s son in law, the painter Tobias Stranover (1684-1724), arrived in England in 1703. This is about the time when Bogdani was beginning to paint his bird subjects. The borrowings found in Stranover’s work from his father-in-law’s oevre suggest that they may have collaborated on Bogdani’s paintings. Similarly the English Art Historian, Antiquarian and man of letters, Horace Walpole (1717-1797) remarked that Bogdani’s son, William (died 1772) “formerly painted in his father’s manner” (See: Green, p.3). This implies that the artist was running a workshop with the aid of those close to him. It is hard to date Bogdani’s work as there appears to be very little stylistic change throughout his career. He is documented painting flowers and still life on his arrival in England and up until the end of the seventeenth century. Following this there is little documentation of the type of works that Bogdani was painting. On the evidence of the large collection of bird paintings by the artist that Admiral Churchill (1654-1710) had amassed by the time of his death in 1710, it can be suggested that Bogdani began to paint his bird paintings in circa 1700. While his flower paintings had brought him in competition with other artists specialising in the subject matter in Britain, including Jean-Baptiste Monnoyer and the Verelst family there were few artists painting bird pictures at this time. Barlow, who was renowned for his representations of animals, died in 1703, leaving artists Peter Casteels and Luke Craddock with whom Bogdani had to compete. As with his earlier flower pieces, Bogdani’s bird paintings, with their variety of species and colours, were becoming an increasingly popular genre in Britain in the early eighteenth century. Six years after his arrival in Britain Bogdani is documented working for King William III (1650-1702). Royal patronage brought him in contact with the British gentry, many of whom commissioned works from the artist. These works fell from popularity after Bogdani’s death. However the variety in Bogdani’s bird paintings with their wealth of colours and textures were extremely popular during his lifetime. Such paintings, including P.6-1950, were suited to the grand interiors of the houses of the British Gentry that commissioned them from Bogdani. Green, Richard. Jacob Bogdani: c.1660-1724, London, 1989. Oil painting entitled 'Composition with Parrots and Fruit' by Jakob Bogdani. Anglo-Hungarian, ca. 1680-1720. Victoria and Albert Museum, Department of Prints and Drawings and Department of Paintings, Accessions 1950, London: HMSO, 1962.